Malt Maniacs & Friends is a large whisky group over on Facebook, full of people who like talking toot about whisky. A recent innocent thread asking for recommendations of which whisky blogs to read (which shamefully only mentioned my esteemed organ on a single occasion) followed the regular path of these things: fevered replying, fevered replying to the replies, slow fading towards a quiet death, revival via sarchasm and then back to the fevered again. 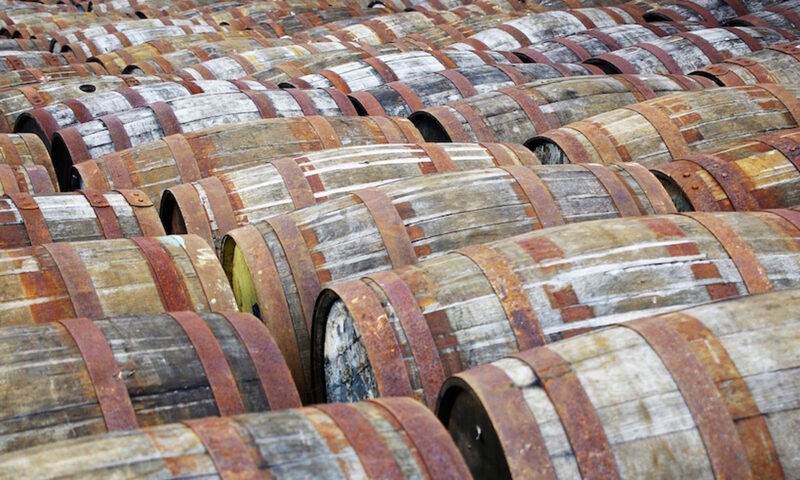 This time I joined in the secondary feveredness, and a tossed-off reply to a comment about wine casks and the perverts who enjoy whisky matured in them has led to this post. I love coffee and I love mustard, but I’d never put mustard into my coffee. Unfortunately, I am a man who loves experimentation and will try anything at least once. Often only once (Marmite, red wine and crème de menthe works better than you’d expect, but it’s not an experience I will be repeating), but not even trying the once feels like cheating. 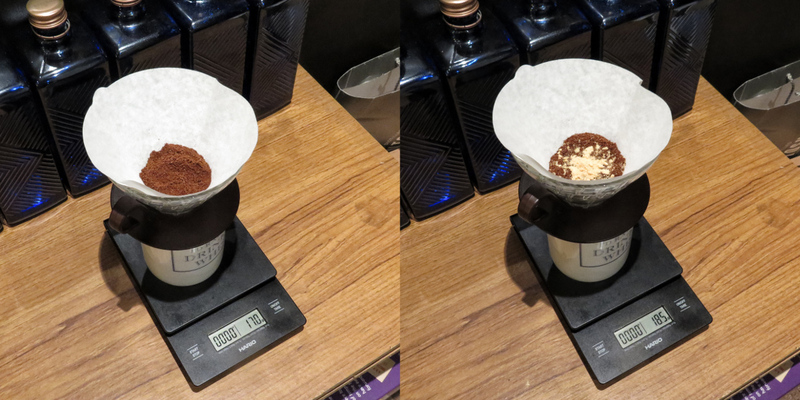 I added 1.5g of Colman’s mustard powder and then made the coffee in my usual way: 30 second bloom with constant agitation, followed by a two-part pulsed pour favouring the edges of the cone, with a swirl of the V60 between the pours. 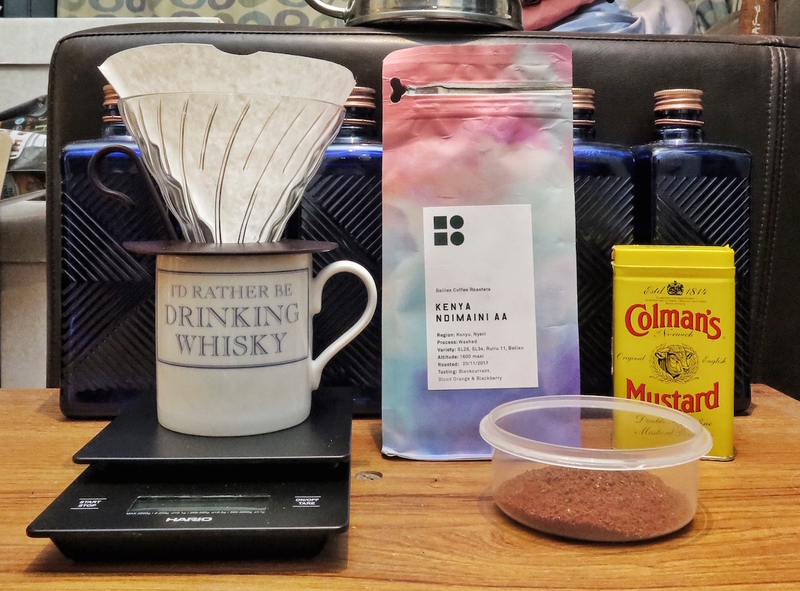 Brew time was about 3 minutes 15 seconds. If you don’t know what the above means, you are a better person than I. Nose: Hints of berries and dark chocolate, but with an unexpected savoury dryness. Also mild eye-watering after sniffing hard and a general numbness spreading from the nose across the face. Palate: Rich earthiness washes across the palate until stopped by a wall of green onion. Sharp edged mustard flavour, without heat, pushes back across the palate, interrupted by a big core of mulchy berries, burnt toast and umami. Finish: Pinches of spice appear, pushed back by bitter chocolate and char. Soft mustard heat lingers. For a long time. About an hour. I think I’m having heart palpitations. Things all seem weird. The mustard does not in this case improve the coffee experience. 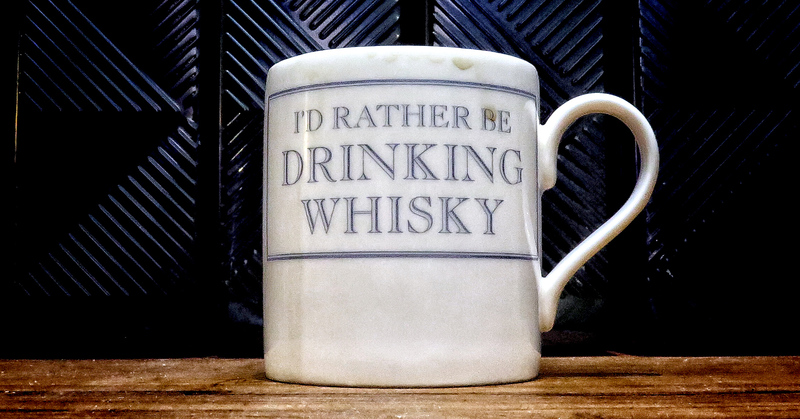 Many thanks to Rachel MacNeill of Whisky for Girls for the excellent mug. Update: Serge Valentin and Angus McRaild took up my challenge and posted a selection of mustard tasting notes over on WhiskyFun.com. Well played, gentlemen. Could have saved yourself some trouble and just had a dram of this Billy. Coffee and mustard mixed precisely in an excellent package. Banff 31yo 1967/1999 (41.5%, The Bottlers, cask #3113) Colour: gold. Nose: probably not as smoky as the G&M but there is some smoke. Also much grassier, with big notes of marzipan and fresh almonds as well as smoked tea (lapsang souchong). Notes of wood varnish, old cupboard, carpenter’s workshop (great oakiness). Add to that a rather splendid fruitiness (cider apples just like in the G&M, quinces…) and you get a superb Banff. I must say I start to understand better our friends who are true Banff aficionados, like MM’s Michel. Mouth: similar to the G&M but even more ‘Banffesque’, with loads of spices and yes, these heavy notes of mustard. Un-sugared coffee. Excellent oakiness (apple peel, almond skin) and something slightly perfumy in the background (orange blossom water). Finish: long, peppery and mustardy, with that oriental background (baklavas). Truly excellent and anything but boring. 90 points.